Some irate youth of Sankore in the Ahafo Region have allegedly beaten the Omanhene of Sankore Traditional Council, Ogyedom Appiah Kubi Paabour Katakyie IV, mercilessly in public. 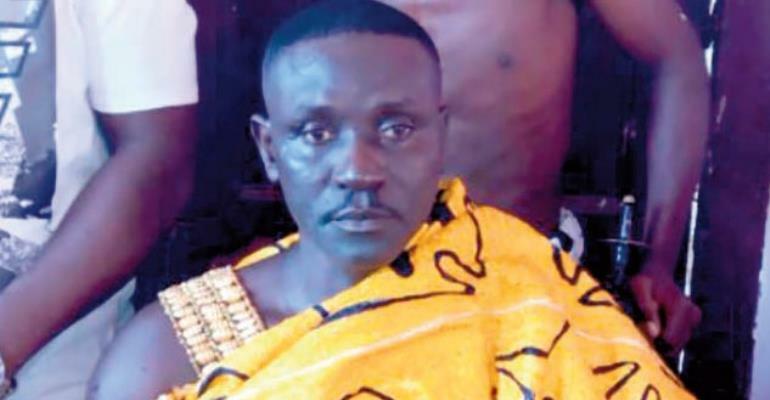 According to sources, the Omanhene and some of his sub-chiefs were manhandled because he allegedly refused to allow an assemblyman in the area – Stephen Akowua Acheampong – to bury his relative at Sankore. The assemblyman confirmed the incident but claimed the Omanhene was not beaten as it's being speculated. Mr Acheampong claimed some of his sub-chiefs were beaten and denied any wrongdoing. The incident took place in the presence of many people at the funeral ground. Ogyedom Appiah Kubi told DAILY GUIDE in a telephone interview that he was indeed manhandled. He stated categorically that it was the assemblyman who organized thugs to beat them. According to the Omanhene, he has already written to the Ministry of Local Government and Rural Development that he cannot work with the assemblyman. The assemblyman later told the paper that there has been a 'fracas' between him and the Omanhene for some time. According to the assemblyman, the issue generated heated debate and the case was sent to court which ruled in his favour. This, according to him, angered the Omanhene so when his relative died recently, the chief sent emissaries to inform the family that he would not allow Mr Acheampong to bury the deceased in the town. “The corpse is still at the morgue because the chief has threatened bloodshed if we go ahead with the funeral and burial,” he told DAILY GUIDE. He said in the ensuing heat, the youth, during the one-week observance chased the Omanhene's messengers out of the place and beat them up. “At the time, I was with the DCE to report his conduct to the assembly and I learnt he later came to the venue himself to stop the family from going ahead with the funeral but he himself was not beaten,” he added. The paper learnt the issue has since been reported to the Asantehene Otumfuo Osei Tutu II for amicable settlement.